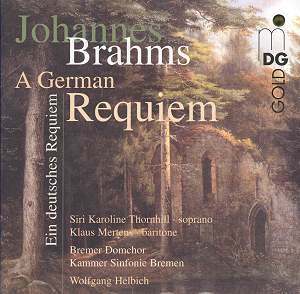 Though heard everywhere, the German Requiem is a work that requires a lot more finesse and attention to detail than many another "perennial". It can safely be said that this particular recording succeeds in these regards only about half the time. In addition, it represents a trend increasingly encountered on disc nowadays: musicians who have made a name for themselves in the early music field applying their methods to music where no recreation of the performing tradition is needed. Werner Helbich and the Bremen Domkor are eminent for their performances of Bach cantatas and music of other composers of the same period, but I found that their Brahms, while admirable for its attention to detail, definitely lacked what used to be called "Romanticism", or vitality, if you prefer. The opening section of the work, Selig sind, die da Leid tragen (Blessed are they that mourn) begins glacially and doesn't really pick up for more than half its length. There is almost no regard paid to Brahms' rhythmic instructions. Things pick up about seven minutes in (...und tragen edlen Samen) where Helbich is able to bring out both the pathos of the music and its lyricism. In this he is well aided by the playing of the woodwinds. He generates some real excitement at the end of the section. The second section, Denn alles Fleisch ist wie Gras (Then all flesh is as grass) is in some ways the most dramatic in the whole work. But in this performance the main theme is taken too fast and the choir is hushed where they should be energetically reverent. Again things pick up towards the end. On the other hand, in the third section, Herr, lehre doch mich ... (Lord, let me know...) the baritone adds some much-needed warmth to the proceedings and seems to inspire the chorus to do likewise. Mertens sings in a manner that is almost conversational and this seems perfectly suited to what Brahms had in mind. The fourth movement Wie Lieblich sind deine Wohnungungen (How lovely is thy dwelling place) features the chorus and they again display much lyrical feeling, sounding more Brahmsian. This is perhaps the highpoint in the performance for them. The soprano appears in the fifth movement Ihr habt nun Traurigkeit (You who now are sorrowful). As she always does, Ms. Thornhill sings clear as a bell and with much feeling. Unfortunately, the acoustics in the Cathedral dampen some of her best moments and her tempi could be a little more lively. But her high notes are lovely. Mertens returns in the sixth section Denn wir haben hei keine bleibende Statt (Here on earth we have no stable place) and while he is not quite as impressive here as in the third section he still combines exceptionally with the chorus, who also are very good in the passage "...wir warden nicht alle entschlafen...". Helbig brings the whole work together in the last section Selig sind die Toten (Blessed are the Dead), perhaps by making it sound more Classical than one would expect. The engineering on this disc is quite good, but it cannot always overcome the cavernous sound of the Bremen Cathedral. This affects the soprano and sometimes the chorus most. The notes by Irmind Capelle - appropriately named - not only ably describe the genesis of the work, but how it has fared as both a concert and a religious work. In short, an earnest but unfulfilled attempt. Sometimes the old ways of performance are the best ways.